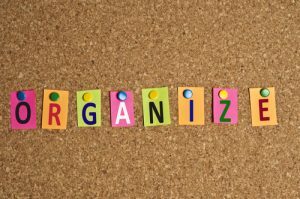 For many years I tried to get organized and stay organized. What I mean by getting organized is not just stacking papers, and placing items in the corners of areas in the home to make the place look aesthetically appealing. I mean intentionally going through every item and deciding what is important, what is not important and what needs to be kept or thrown/given away. Adding on to the pile of things at home without figuring out how these items will compliment the home and maintain the purpose. There is nothing wrong with buying new items for the home, but many times, we might pick up decorative pieces, or specialty items without asking ourselves whether they are needed, or whether they add to our home, or will they get lost in the background. Trying to declutter and organize the entire house. When I get excited about getting organized and freeing up space in the home, I can get overly ambitious about taking on this task. Trying to tackle every room in the home in the span of a weekend, can be problematic. After some time, your ability to assess whether an item is a keeper or a goner gets weakened but the sheer repetitiveness of this task. This can lead to keeping items you don’t really need or getting rid of items you may need in the future. It is much better to piece meal such a project and focus on one room each week (if need be). 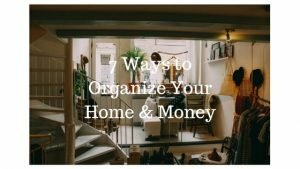 Now that we have looked at some of the traps that keep us from staying organized, lets address 7 ways to organize our home and money that will provide a lasting effect and hopefully make our lives easier. Filing taxes can be a pain and many people rely on tax professionals to process their tax return and deal with the government. Others may opt to file their own taxes. In both instances, a well-organized filing system to keep your financial and tax documents is important. Keep receipts organized & itemized. If you own your own business, then you probably have a lot of receipts to deduct against your income. Try and itemize the receipts according to which expense category they fall under. If you have maintained a computerized accounting system throughout the year, pulling this information will be a lot easier. Keep a copy of your tax slips and mark carried forward or unused amounts. Some tax entries may allow you to carry forward certain expenses and deductions to future tax years (e.g. charitable donations, capital gains/losses etc.). Be sure to mark slips that have been carried forward or back and the amount in question. This will make cross referencing in the future easier. Use an accordion folder. Use an accordion folder to separate tax years. These folders are also good for storing important documents like: contract agreements, investment summaries, loan documentation etc. The best time to declutter and organize your financial documents is at least a month before tax time. This will allow you to inquire about missing receipts, slips and documents before you need to file. Maximize the current space you are using by organizing your clothes at least twice a year, in the spring and fall. Organizing includes not only figuring out which clothes to get rid of, which clothes to keep, but taking an inventory of the types of clothes you have and what you might still need. It also includes pairing possible clothing combinations together to see what styles you can come up with. This is a great way to maximize your outfit options without needing to buy more clothes. HGTV talks about organizing your closet in “clusters.” This is a group of five to eight clothing pieces that work together. By sorting your clothes into clusters, you can quickly pick out possible clothing combinations that may not have been apparent if the clothing items were on separate ends of your closet. Another option may be to organize by color and not season or style. Organizing your closet saves you time from having to find outfits and money, from buying too many clothes when a few items matched well would do. Implement the 80/20 rule with your cards. This universal rule can be applied in so many areas of our life. If you think about it, you probably spend 80% of your money on 20% of the stores you visit. That one time you bought that piece of clothing, jewelry etc. at that one store wouldn’t be enough to warrant getting a loyalty card just so it can take up space in your wallet, or you completely forget you had it in the first place and don’t realize until you empty your wallet. Instead, consider getting and keeping only the loyalty cards from the stores you frequently shop. Even if the other cards are free, you wouldn’t use them enough to make it worth the space in your wallet. Know what you are getting. Understand how the loyalty cards work, how you collect points and how you can redeem them. Some memberships like AMA or Airmiles also offer additional discounts (in addition to the points), when you shop at select partner stores with the card. Transfer your loyalty cards to a digital wallet. It is a hassle carrying a ton of loyalty cards, many of which you may not use. Consider using a free app to add all your loyalty accounts on your phone, and leave your cards at home. A good app to use is Stocard. This app has over 5 million downloads and a 4.6 rating. It allows you to store all your loyalty points in one place, freeing up your wallet for other things. Organize by food category. Many times, we buy canned goods we already have at home because they were stored in the wrong section of the pantry. To avoid wasting money, keep similar canned food items together. Some possible categories include: canned vegetables, canned fruits, pasta and tomato sauce, canned meats, oils, spices and carb based foods like rice, noodles and pasta. Keep smaller cans up front. Since canned goods comes in different shares and sizes, keep the smaller/shorter cans towards the front of the pantry and the larger/taller cans at the back. When we are putting together our grocery list, this makes it easier to determine what still needs to be purchased. Plan means with pantry items. Take an inventory of the pantry items you have in stock, and plan meals over the coming weeks and months to incorporate some of these items to clear up your pantry. This will help you save money and help you declutter your pantry over time. Donate the food to a worthy cause. You can also donate your canned goods to your local food bank. Empty out the spice rack. Using the 80/20 rule again there are probably 20% of the spices we use 80% of the time. However, most of us have more spices then we know what to do with. Maybe we bought it for a special recipe over Thanksgiving or Christmas, or we took a cooking class years ago and were experimenting with different recipes. If there are certain spices you never use, get rid of them or give them away. If you think you might need the spice in the future, chances are you won’t (because if you did you would have used it already) and if you happen to need it, you are much better off going to stores like Bulk Barn, where you only buy the amount of spice you need. This will save you pantry space and money. Track your spending for a month. If you use a cash only system, then you will need to keep all your receipts and categorize them at the end of the month. If you use plastic, then simply review your bank statements. Conduct a thorough audit of your spending. Luckily many apps will automatically categories your expenses, however, the categorization may not be accurate, or may not reflect the categories you would like to implement for your budget. Thoroughly review your receipts and bank statements (you may want to export your bank statement files onto Excel to make them easier to manipulate) to see how you spend your money and make your own categories. For example, some people have groceries as one category to account for most consumable items purchased for the home. Others may split this entry up into multiple categories like groceries, toiletries, house supplies etc. Either option works, but it needs to reflect how you spend and maintain your budget. Implement revised categories. Once you have all your categories, revisit your budget with the revised categories and test out your new budget for a few weeks/months. Storing things digitally is simple, easy and convenient. However, because of the enormous amount of digital space technology offers us, we probably have space used up ineffectively. A cluttered computer can make it difficult to easily find things like movies, photos, documents etc. It is also using up valuable storage space that can used for something else. Lastly, it can also slow down the speed of your device if the item saved is stored in the hard drive. Here are a few suggestions for organizing your digital life. Categories items you want to keep into folders that describe the contents inside. File folders keep things tidy and make it easier to find things. Avoid having a bunch of individual documents scattered throughout your desktop/computer as this can make it difficult to find things. Deleted items you no longer need including movies, photos, documents, music etc. Use free cloud storage whenever possible. Using services like One Drive or Google Drive to save your digital files will not only ensure you have access to the file wherever you have internet, but also keep your hard drive free and your computer running quicker. Keeping the study/work desk clear from stacked papers, food or other items that may distract us. Organizing our office supplies to make them visibly accessible and convenient.